My parents worked hard for their money, and they didn’t like to see it wasted unnecessarily. They definitely passed that trait on to me. That being said, I love to shop, and I frequently indulge in retail therapy. Shopping lifts my mood when I’m feeling down. Here’s the rub though…I really like having nice things, but I hate spending a lot of money to get those things. I refuse to spend full-price on anything (unless it’s wine or chocolate). Sometimes, my parents would take us to bigger name stores like Macy’s and JCPenney, but we would always go straight to the back of the store. My mom taught us to never start shopping at the front of the store. The front is where stores lay out their most expensive, in-style, and seasonal clothing. It’s where they make the most money. Always, always start at the clearance racks on the back wall. If you can find what you need on those racks, great! You’re done shopping and you probably saved upwards of 80% on that piece of clothing. If not, no worries. You can try walking through the store and decide if you really want to spend $30-$40 on one shirt. Or you could continue on to another store’s clearance racks and end up finding 8 shirts for $40 total. When you look at the clearance racks, the jumbled clothes are either out of season or out of style. That’s why stores willingly part with them for so low a price. Their loss is your gain. By searching through those mish-mashed clothes racks for timeless pieces, you can be sure to look your best without shelling out hundreds or even thousands of dollars on your wardrobe. Look for solid colors in classic cuts. Exercise gear, knee-length work attire skirts, black pants, and classic cut jeans are all items that inevitably end up on the clearance rack because of overstocking or the season coming to an end. Don’t walk into any retail establishment and plunk down $50 for a pair of pants. You can get those same pants in a few months on their clearance racks or at a closeout store for $5. If you are willing to hold off on keeping pace with the latest fashion trends, you can save yourself a lot of money. Just this week, I bought a pair of black, flannel-lined winter leggings off of the clearance rack for $3. In season, those exact leggings cost $30. By having the forethought to buy ahead for next season, I saved 90% of the original price. Do I like the item, does it look nice, and does it fit well? Is the item timeless? Can I wear it next month, next year, or 5 years from now? Name brand or not, if the answer to those questions is yes, then buy the item! All seven of these closeout stores have name brand clothes for a fraction of the original price. Searching through their endless racks of clothes to find the best deals is exciting. I love to see how little I can spend on really nice items. I especially love that some of these stores also have loyalty reward cards and semi-annual sidewalk sales, giving customers even better opportunities to save money. 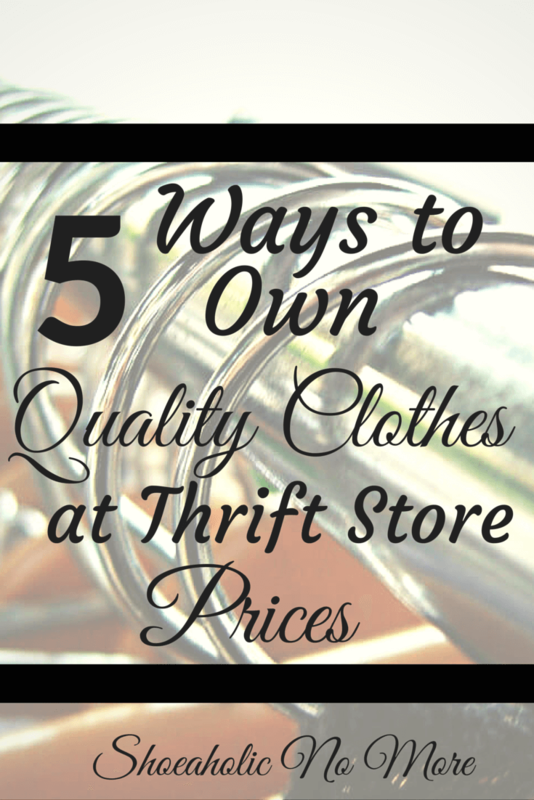 Living on a tight budget or a limited income can make shopping for quality clothing seem impossible sometimes, but having a little bit of forethought can save you a lot of money in the long run. Be creative, look through stores you have never been into before, don’t stay staunchly loyal to your favorite name brand, and you will look great without emptying your wallet. 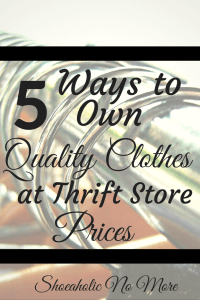 Do you shop around to get the best prices on clothes? What other methods do you use to save on clothes? I have never shopped from a thrift store before, but that is because we don’t have one where I am from. I am sure there are some great finds there and I plan on visiting one. For the most part I shop at discount stores for my clothing. Method to save on clothing is to always stick to my list and go once in a blue moon. Sticking to a list is a great way to make sure you don’t go over budget or purchase something you don’t need. I too love shopping from a list! Awesome post and welcome to Kayla’s blog, Kristi! I always like to shop in the back of the store too haha. Clearance is awesome. Thank you, Cat! Clearance is my favorite part of the store! Nice tips! I’ve made a habit of shopping sale and clearance racks at stores. I also signed up for emails from favorite stores, which tend to send out coupons regularly (I’ve found this is a double-edged sword, however, as it can also lead to more temptation to shop!) I moved abroad late last year, and clothing tends to be quite expensive here. My current plan is to do most of my shopping while visiting the U.S. once or twice a year. You are so right, Jennifer. Clothes shopping abroad can be quite expensive. I’m sure that shopping only twice a year saves you a lot of money though! I love these tips and use all of them myself. One of my favorite things is when an item I’ve been wanting shows up in the sale/clearance section! I also love to shop at Marshall’s and TJ Maxx, but I have to be strict with myself or I’ve found I’ll buy things I don’t really need just because they’re cute and a great deal. The struggle is real, Jessica! T. J. Max especially holds a great deal of temptation for me in their shoe and purse sections. Buy clothes off season – that’s a big one. And some brands have really good Boxing Day sales. I’ve gotten shirts at Tommy Hilfiger for 50% off. I too believe that Holiday sales are always worth the effort! Black Friday and Cyber Monday are great days to find items you need for drastically lower prices. I typically buy clothing online, going through Ebates, and waiting for end-of-season sales. When I go to stores, I love the clearance racks!! That is a great point, Amy. Online shopping has “clearance racks”as well. You don’t always have to go to the brick and mortar store to get great deals. Welcome Kristi!! Great tips 🙂 Can’t wait to read more from you. Thank you, DownstairsAndInDebt. I am very excited to be posting on Shoeaholic No More!